Fatima Khalid of London company Digital Echidna was named "Rising Star" of 2018 by Women in Communications and Technology, an organization dedicated to the advancement of women in the communications and technology industries. London-based web developer Fatima Khalid won the "Rising Star" award from Women in Communications and Technology last week. Khalid, 25, is a back-end developer for the London company Digital Echidna, which uses the content-management tool Drupal to design websites for clients. "It's incredible. It's so unexpected and it's also just really starting to sink in as people start talking about it," Khalid told Afternoon Drive host Chris dela Torre. Growing up in the suburbs of New York City post-9/11, Khalid was often subjected to religious and ethnic discrimination. Her father, who also dealt with prejudice regularly, taught her to stand up for herself and challenge people who use stereotypes. "I feel like my family and my work environment and my mentors have always encouraged me to be fearless and be creative. And if someone says something wrong or stereotypes me in the wrong way, I have to call them out on it," she said. After graduating from New York University with a degree in computer science and broadcast journalism, she worked for Microsoft and the city of Boston. Khalid came to London in 2016 to work at Echidna. At NYU, her classes would often have 15 males for every female student. One of her professors told her it was just something she'd have to get used to. "It was to the point where the professor would be like, 'The girl in the back, you can answer the question,'" she said. Being treated differently didn't end there. "I'll go to a conference and people will automatically assume that I'm a designer or a front-end developer," she said. 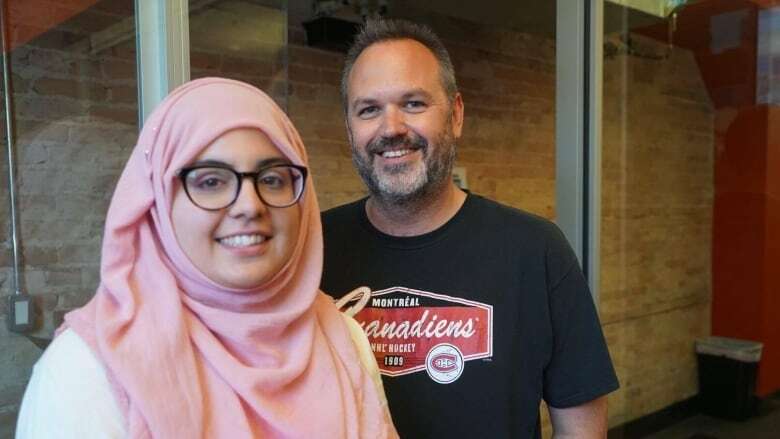 Khalid is happy at Echidna, and will closely follow the digital ambitions of Canada's government — including efforts to teach children and youth to code. But speaking at TEDxWesternU is the next major goal that comes to mind. "That'll be the next target, I think."